Background: Laparoscopic splenectomy (LS) has been established as a safe and effective alternative to open splenectomy (OS) for the treatment of Idiopathic Thrombocytopenic Purpura (ITP). The purpose of this study was to review our teaching institution’s experience with splenectomy for ITP. 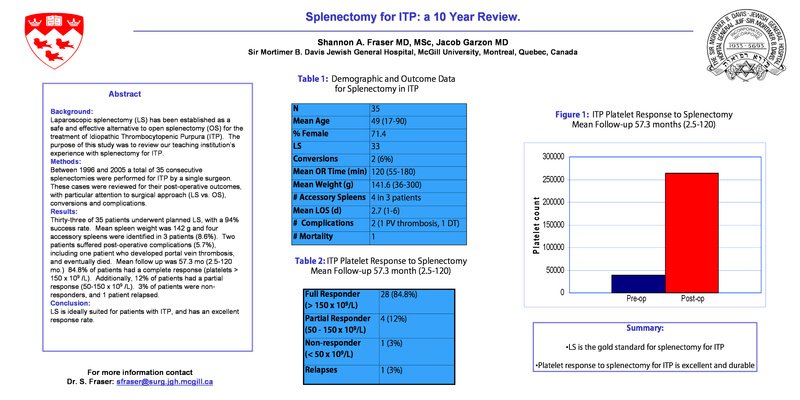 Methods: Between 1996 and 2005 a total of 35 consecutive splenectomies were performed for ITP by a single surgeon. These cases were reviewed for their post-operative outcomes, with particular attention to surgical approach (LS vs. OS), conversions, complications and platelet response. Results: Thirty-three of 35 patients underwent planned LS, with a 94% success rate. Mean spleen weight was 142 g and four accessory spleens were identified in 3 patients (8.6%). Two patients suffered post operative complications (5.7%), including one patient who developed portal vein thrombosis. Mean follow up was 57.3 mo (2.5-120 mo). 84.8% of patients had a complete response (platelets >150 x 109/L). Additionally, 12% of patients had a partial response (50-150 x109/L). 3% of patients were non-responders, and 1 patient relapsed. Conclusion: The response rate to LS for our ITP patients is excellent, supporting the use of this approach as the gold standard for the surgical treatment of ITP.